Suicide is a common cause of death and can impact anyone or any family. Self-harm also affects thousands of people every year. In this section you will find guidelines for reporting on suicide and self-harm, definitions of these issues, common myths and facts, and the impact of stigma. *A note on copycatting* Copycat suicides account for about 6% of all suicides with evidence suggesting that copycatting can follow certain types of news reports and media portrayals of suicide. Audiences can identify with characters in your story in unpredictable ways. Guidelines are in place to prevent as many copycat suicides as possible. Avoid excessive detail on the method of suicide or self-harm. e.g. Instead of detailing the type and quantity of medication or poison used, say "a number of pills", or "a poisonous substance". Instead of detailing the type of ligature used, and explicit details on how it was used, say "died by hanging". Avoid potentially harmful language: Commit suicide, successful/unsuccessful suicide, suicide hotspot, suicide epidemic. Commit suicide: Suicide has not been a crime in Ireland since 1993. Instead use "died by suicide", or "killed themself". Successful/unsuccessful suicide: An attempt at suicide should not be linked to success or failure. Instead use "complete/incomplete suicide". Suicide hotspot: Images related to the location of a suicide can draw vulnerable people to imitate that behaviour at that location. Always include contact details of where vulnerable readers/viewers can find help. Depiction of a suicide in a TV programme may be damaging if it shows a character that has attempted suicide as immediately recovered. It is also important not to brush over the complex realities of suicide and its devastating impact on those left behind. Avoid disclosing the contents of any suicide note. This information may sensationalise or romanticise the suicide. Details in it may encourage others to identify with the deceased, leading to imitative behaviour. It is also private, and may unnecessarily upset close friends and family further. They may contain information on methods for self-harm or suicide and can cause imitative behaviour. Don’t over emphasise the ‘positive’ results of a person’s suicide or self-harm. A dangerous message from the media is that suicide achieves results; it makes people sorry or it makes people eulogise you. People don’t usually decide to take their own life in response to a single event, however painful they may be, and social conditions alone cannot explain suicide either. The reasons an individual takes their own life are manifold, and suicide should not be portrayed as the inevitable outcome of serious personal problems. Expose the common myths about suicide and self-harm. There is an opportunity to educate the public by challenging these myths. 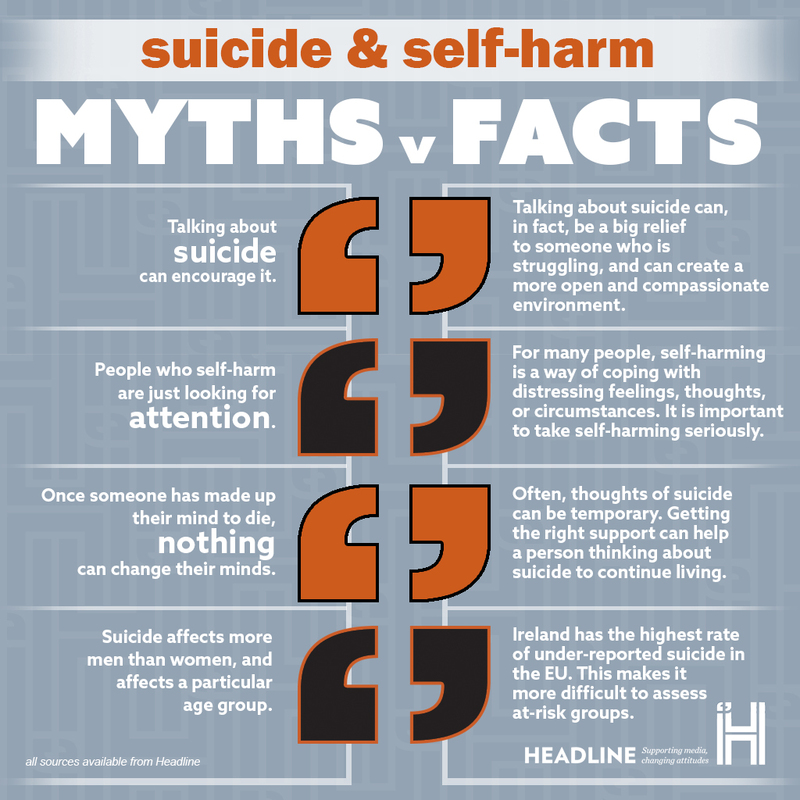 Some of the myths and facts about suicide and self-harm are outlined below. It might be helpful to offer interviewees some support such as Samaritans or bereavement support contact information. Suicide is the act of deliberately killing oneself. It is a global health issue and currently more people die by suicide in Ireland than in road traffic accidents. Self-injury, also known as self-harm, self-mutilation, or self-abuse, occurs when someone intentionally and repeatedly harms themselves in a way that is impulsive and not intended to be lethal. The way in which the media report on suicide can influence other suicides. The media can also, often unintentionally, add to the stigma surrounding suicide and perpetuate myths. The media has a responsibility to report on suicide in a responsible and sensitive way. We believe that the media has the potential to play a very important role in educating the public about suicide and encouraging people to seek support. Suicide can be a painful and difficult subject to discuss, yet it affects us all. Suicide remains a taboo subject for many people. Shame and discomfort may act as a barrier to people discussing suicide openly. Stigma has led to much misunderstanding and misinformation about suicide and can prevent people in distress from seeking help. Similarly, stigma can prevent people who have been bereaved by suicide from discussing their loss. Many of us do not know what to say to someone who has lost a loved one through suicide. Sometimes, people believe that discussing suicide can encourage it but this is not the case. Serious and open discussion of suicide helps destigmatise it and may make it easier for someone to open up and seek support. Discussing suicide can also help dispel the myths and misinformation that surrounds it.